Lynch and Taylor became completely submerged along with their snowmobiles, Carignan and Smith escaped going in. SEBEC, Maine — Shortly after midnight Saturday morning four men, 30-year-old Timothy Carignan from Berwick, 31-year-old Nicholas Smith from Berwick, 32-year-old Nathan Lynch from North Berwick and 39-year-old James Taylor from Dover, New Hampshire, ran in to thin ice on Sebec Lake said Game Warden Corporal John MacDonald. Wardens say Lynch and Taylor fell in, along with their snowmobiles, while Carignan and Smith managed to stay out of the water. Lynch and Taylor eventually got themselves out and onto the ice, according to MacDonald. Taylor drove one of the two remaining snowmobiles to an unoccupied camp to find warmth. MacDonald said the three remaining men were stranded on thin ice near portions of open water. Carignan called 911 and around 1:20 am. 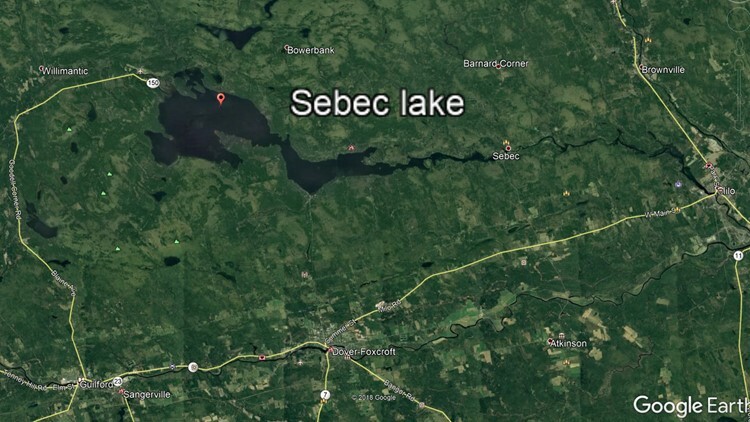 Sebec Fire Department, Mayo Ambulance and Game Warden Jeremy Kemp arrived shortly thereafter. Kemp got a canoe from a camp owner and he and a Sebec Firefighter, Jason Horne, went out onto the ice with the canoe. Rescuers got the canoe close enough for the three stranded men to get in, but the canoe became overloaded and Carignan had to get out. He partially broke through the ice, but managed to hold on as rescuers pulled him across the ice to safety. MacDonald said the four men were unfamiliar with the lake. Lynch and Taylor’s snowmobiles are still on the lake bottom in about 12 feet of water. Smith’s machine remains on the ice because wardens said it was too dangerous to remove it overnight. The incident remains under investigation and game wardens will be on scene again today.